If you know me, or my blog, even just a little bit, then you know I talk about The Woman in Black a good deal... In fact, I probably bang on about it far too much, especially at this time of year. 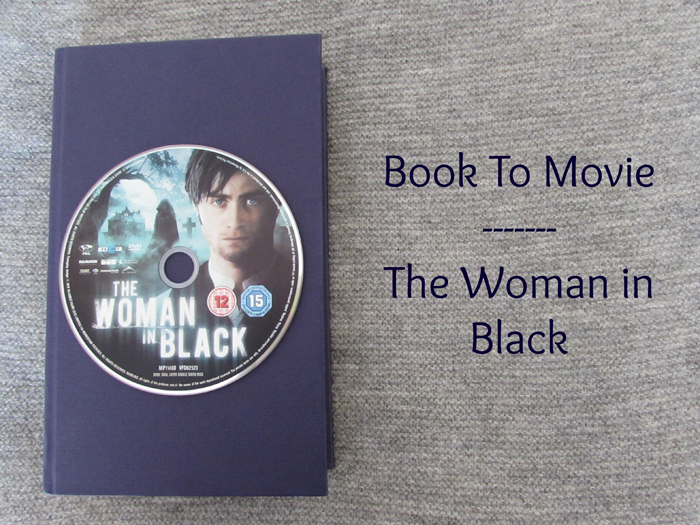 One post I've been keen to do in relation to The Woman in Black is a book to movie post - wherein I give you a brief description of the premise and then share a bit about both the book in written format as well as visual. Also sharing which format I prefer. If you're interested in hearing further thoughts of mine, then carry on reading! The Woman in Black is the story of Arthur Kipps, a junior solicitor who is put in charge of dealing with the papers of Alice Drablow. Alice Drablow is a long time client of the firm in which Kipps works, and he is sent to attend her funeral in the small village of Crythin Gifford, as well as deal with the paperwork and loose ends surrounding her home, Eel Marsh House. Whilst attending to his work in the village of Crythin Gifford, Arthur senses something ominous surrounding the Drablow house and this is further fuelled by his sighting of the woman in black. Keen to garner a better understanding of Alice Drablow, the woman in black, and the village stories, Arthur forges onwards with the work he is in charge of, however there is a consequence to these actions and his short time in Crythin Gifford leads to life changing matters. In book format, the story of Arthur Kipps is narrated by the man himself; recalling the story after a frightful night in which ghost stories are told between family and one is asked of him. Having the story narrated by Arthur Kipps definitely lends to a feeling of foreboding throughout, and makes the story feel all the more powerful to the reader. The Woman in Black is of novella length, so neither particularly long nor short, and is perfectly well paced to keep the reader engaged. The prose are atmospheric and immersive, with the words of Kipps being enchanting even, holding your attention throughout. Because of the length of the story, I personally feel it is best read all in the one go, and is very much easily doable if you have a few hours spare. I had forgotten how creepy the film adaptation of The Woman in Black is - much like the book, it is atmospheric and gothic in its approach. The film starts at a different point than the book, as in the adaptation we do not meet Kipps as an older man, only in his 20's working as a junior solicitor. There are also a couple of lifestyle differences that impact on the story, including the fact that he already has a child and his wife has passed on. In the book, this is not the case - he is engaged to Stella, and they are working out plans for their future. This small little difference actually has a large impact on the story overall, and in fact, without saying too much, the stories differ in conclusion because of this. The way I word it to others is that the film very much has a 'Hollywood' stamp. The plot of The Woman in Black has been altered slightly for the big screen, but the darkness of the story and the general premise relating to the woman in black remains. One thing that I think translated really well for the big screen is the relationship between Arthur Kipps and Samuel Daily (a villager in Crythin Gifford). Regarding the film, I was a little uncertain at the main role being played by Daniel Radcliffe, of Harry Potter fame. Often times, when an actor has played an iconic character in film, it is hard for them to step away from that and been seen as a different identity all together. I thought I would experience this with Daniel Radcliffe after being such a fan of the Harry Potter films, however there was no need for worries. Daniel Radcliffe played the actor of Kipps perfectly, and I couldn't imagine another actor in his place. It is the premise itself, in varying formats, that I love so much about The Woman in Black. Having to pick a format, be it book, film, or even theatre show (which I would highly recommend also), I'd always pick the original, the book. I revisit the story often, and I've actually reread it twice this year alone! As I said above, it is the premise itself that I love so much about this story, and I highly recommend you check it out in one format or other. Now is an especially good time, be it book or film, to discover the haunting story of The Woman in Black.